New technology designed to read the unique shapes of each nose could be used to identify Illegal immigrants, terrorists and criminals, experts claim. 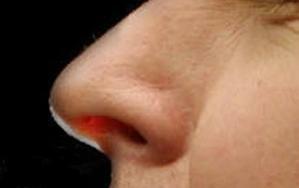 Scientists have discovered an unlikely new weapon in the fight against international terrorism – the human nose. The nose is more reliable than fingerprints or irises as a means of identification because it is harder to conceal, they say. A new scanner, known as the PhotoFace, takes four flash-lit photographs lit in rapid succession from several different angles. The nasal images are then analyzed according to six main shapes – Roman, Greek, Nubian, Hawk, Snub and Turn-up. Each nose is then further tested by computer software to analyze its profile, the tip, and the nasion – the top of the nose where it meets the eye line. Dr Adrian Evans, who conducted the research behind the technology at the University of Bath, said scanning noses could be an easier way to verify an identity than iris and fingerprint scans. & #39;& #39;There& #39;s no one magic biometric – irises are a powerful biometric, but can be difficult to capture accurately and can easily be obscured by eyelids or glasses,” he said.